Sudden, drastic credit score drops are never a very pleasant surprise. If you have been working hard to improve your credit scores, either on your own or with the help of a professional, then a credit score decrease can be downright infuriating. Unfortunately, there is not always an easy answer to the question “why did my credit score suddenly drop?” The answer to that question will depend upon a variety of factors, all of which can be found in the same place – your credit report. Although the exact causes behind a decrease in your credit score can vary widely, here are 3 common reasons why your credit score might have dropped over 100 points. A forgotten payment can often be the culprit behind a sudden, unexpected credit score decrease. The negative impact of a forgotten payment can be magnified further if a creditor is currently reporting a “past due” balance on your credit reports as well. One of the very first areas you should investigate if you experience a credit score drop is the payment history section under each of the accounts on your credit report. Depending upon your credit, even a single new 30-day late payment could be significant, especially if a past due balance is reported on the account. Credit scoring models are designed so that the higher your credit score is to begin with, the more a single mistake could you hurt you. A consumer with an otherwise clean credit report is probably going to suffer a much more significant credit score drop from a new late payment than the person who has a number of other late payments already appearing on his report. Another potential explanation for why your credit scores may have dropped severely could be that derogatory or negative accounts were added to your credit reports. A derogatory item might be a new collection account, a new judgment, a new tax lien, a new bankruptcy, etc. If you ever experience a sudden drop in your credit scores you should check your 3 reports right away to see if any new, negative items have been added. Remember from above that a new credit problem can cause good credit scores to decline more severely than lower credit scores. 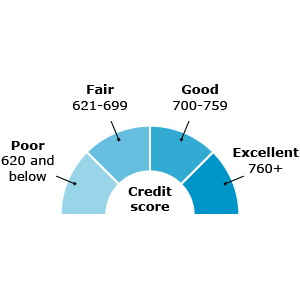 A consumer with a credit score of 780, for example, is probably going to suffer a much more extreme credit score drop from the addition of a new collection account when compared with a consumer who had a beginning credit score of 580. There are times when a credit score can decrease drastically even if you personally have not done anything wrong. Credit scoring models are designed to evaluate the information contained in your credit reports and issue a score based upon that data. This can be a problem whenever an error appears on your credit reports because a scoring model will not know the difference between a legitimate account and a mistake. The same can be said when identity theft occurs. A scoring model is not going to be able to differentiate an account that you legitimately opened from an account which was opened fraudulently in your name. If an item appears on your credit reports, then it is typically fair game to be considered in the calculation of your credit scores. Thankfully, you do have rights whenever you are the victim of credit reporting errors or fraud. One of your rights is the right to dispute inaccurate credit report data with the credit reporting agencies. You can initiate disputes on your own, or you can hire a professional to help you navigate the process. Either way, you should never ignore credit reporting inaccuracies because the consequences of doing so can be very costly. CLICK HERE or call 888-617-6841 to start renovating your credit and your lifestyle today.